This has been growing really slowly. Rather, it hasn't been growing at all. I got stuck. Here's why - I realised that this was turning into a medallion quilt and having just finished one of these I thought I'd like to try something else, but found myself going round and round the little elephant in the centre. Now it may be that in the end he just wants to be in a medallion and I may have to backtrack, but for now I'm trying this: I drew a couple of very, and I do mean very, rough sketches. I've only ever done this once before, but it worked okay, so it was worth a go. This is where I got to. Joining Show and Tell Tuesday at i have to say..., Let's Bee Social at Sew Fresh Quilts , WIP Wednesday at Freshly Pieced and Needle and Thread Thursday at My Quilt Infatuation . There's some great stuff - go take a look! It's darling. Love the colors. Here's my suggestion. Tweak it. Look at your sketches. If the circles are block centers, you should offset your own blocks more. The sketches have much more movement. Thanks Ann. You're right. I think also that I have let the elephant chunk get a bit too big. I might take it back a bit. Did you know you were a no reply blogger? I agree with the suggestion made by Ann. Also, your elephant looks so great against the white background. Maybe you could add more white to help break things up? I love where this is going! I'm glad you weren't offended getting critiques from an absolute stranger. I really like your work - this and the other quilts you posted. They are so free-flowing, great color and design. Do you usually work from a sketch or do you just put them up on the wall? 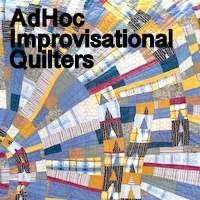 I hope to see more of your process as this quilt proceeds. You might be right about the elephant chunk. It does look a bit larger than the section I identify as the elephant in your sketches. But oh, I hate to unsew. And no, you're the first person who's had trouble replying to me. I'm on Blogger and replying as myself. If you have trouble this I'll look up what I need to do. Thanks. Not offended at all! I agreed with what you and Lorna said and am working on from that point. I haven't cut the elephant chunk down but am pretty sure I'll have to. Hopefully I'll have got something to show in a day or two. I'm so glad you like my quilts and are finding the process interesting. I have only worked from a sketch once before, on a project I'll blog once it's finished (and the person it is for has seen it). I don't know why that seemed to be the way to go this time. Usually I just work straight from the fabric, on the wall, or on the floor. I would have send you a longer reply via email, but again you came in as a no reply blogger. I love seeing sketches of ideas and wips! I won't make suggestions because your work is strong and I see you know what you're doing!